I grew up in the Los Gatos, San Jose area of California. This region did not have lakes but it did have a park and reservoir named, Vasona. In the middle of suburbia and congestion, it was a nice escape of fifty-seven acres water surface where one could picnic, rent boats and enjoy hiking at the water’s edge. There were even areas where fishing was allowed. It was not enormous, but it was a welcome respite from asphalt and concrete. A reservoir can be enjoyed by many but there are limits. It is contained to one specific area. A channel however, may have wider access and appeal as it is not so contained. Water flowing through a channel can meander through miles and miles of countryside. I recently heard a pastor ask if we were behaving like a reservoir or a channel! Our verse for today reminds us of God’s purpose for our lives. Although good works are not the means of our salvation, they do indicate a life that is saved. He wants our lives to have an influence for Him. There are good works He has planned in advance for us to accomplish. He wants to channel His blessings through us to others. With God’s Spirit living within us, we are filled with streams of living water! There are “thirsty hearts” surrounding us in desperate need of His living water (John 4:10). It is too easy to remain a “reservoir,” not bothering to leave my comfort zone. Lord, keep me moving towards those who are thirsty for You! 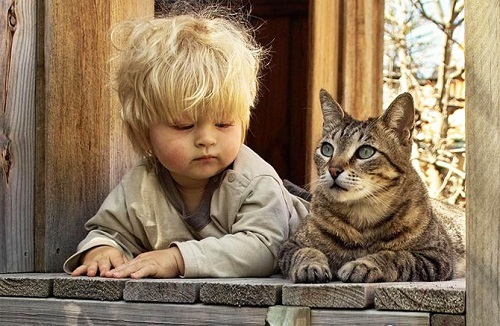 I love how this sweet toddler places his hands exactly as the cat places his paws! Being around my grandsons reminds me just how often we learn by imitating those around us. It is almost scarey how much little ones pick up mannerisms and speech patterns from whoever is in their lives. So much of imitating others is unintentional. One would think that as adults we were more discerning about what we imitate but that is not the case. Slowly but surely, as I adapt to another culture, I find myself imitating styles and colloquial expressions. Our verse today is a gentle warning from John to his friend, Gaius. It is sandwiched between an observation he makes of two men; one to imitate (Demetrius) and one who should not be imitated (Diotrephes). The one has a good reputation, while the other is full of pride, wanting to be first and refusing to welcome other believers. John is pointing out how one’s behavior can reveal the heart. Rather than imitate a leader because of his smooth speech and polished image, we are to imitate those who truly practice what is preached! It is important to be intentional about the friends I choose, as my tendency to imitate others is so strong. Prov. 12:26 says that the righteous choose their friends carefully. I want to surround myself with those who challenge me to live a more godly life. And I want to be that kind of influence for others too! Lord, keep me imitating all that is good in those that truly know You! Categories: Cat Images, Holiness | Permalink. 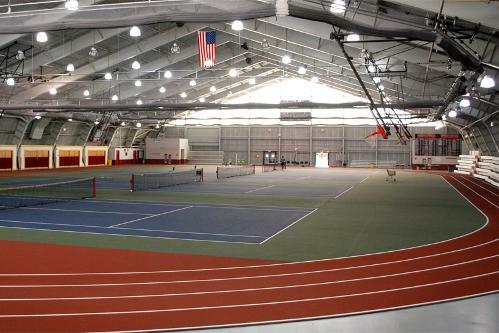 In New Jersey while visiting our daughter and her family, I was able to use an indoor track much like this one. How great to get in a good power walk without worrying about the weather! The distance was simple to calculate and the surface was spongy and easy on the feet. The only inconvenience was the monotony. The views did not change and boredom could easily set in. The experience felt very repetitive as there was nothing new to see around the next turn. Sometimes in my Christian walk I feel like I am going around in circles. The trials I have lived through in the past seem to repeat themselves. They may be repackaged just a bit, but I can still recognize them. It can feel frustrating as I thought I had sufficiently learned the lesson God wanted me to learn. Yet here I am again, seemingly going over the same ground. In our verse for today, Paul is repeating a command. Rejoice! He had just said it, so did it really need repeating? Paul repeated himself several times in his letters (II Cor. 11:16, Gal. 1:9). Jesus Himself would repeat His words to emphasize a point (Matt. 18:19, 19:24 and John 10:7). What is true and important bears repeating! I need to hear it again and again….”rejoice!” Repeating is an excellent way to make something stick. What I think I have learned needs to be reviewed and looked at from another angle and applied in a new situation. The Lord knows when and where and how I need something repeated. Nothing He teaches me is a waste of time. Trusting Him means trusting His lesson plan! Keep me teachable Lord, even if I have heard it before! 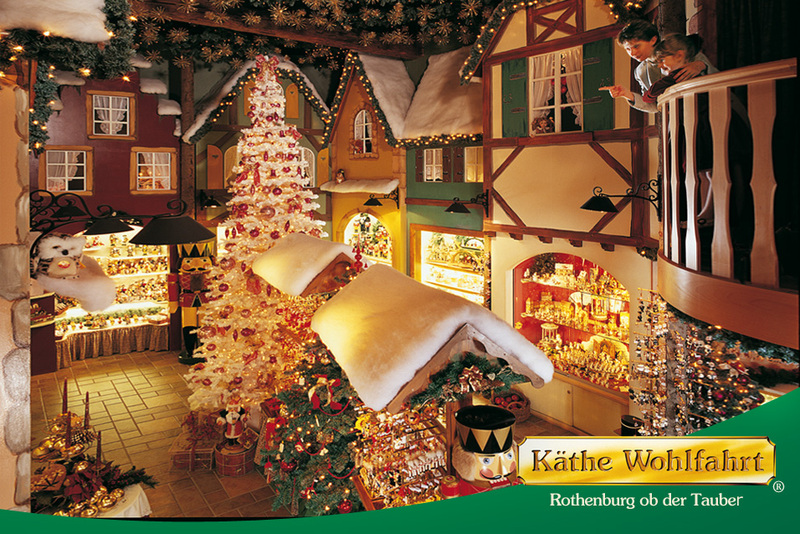 My favorite Christmas store in the world is the Käthe Wohlfahrt store in Riquewihr, France. The German store is a chain but this particular location is magical in itself! Looking over that railing at the scene below always fills me with wonder and delight. Expectations are high every Christmas season to somehow create that perfect decor or that perfect setting. If everything is well-planned and well thought out, then surely there will be peace on earth and good will everywhere! These are perhaps unrealistic expectations. The day after Christmas can especially be a bit of a “let-down.” The presents are unwrapped, the sugar high is finished and one wonders where that warm fuzzy feeling went. If we could just stay in that place of beauty and contentment! Our verse for today speaks of a place where we can constantly dwell. There is no day after. One never needs to leave. There is beauty in this place. Expectations are never too high so there is no let-down. To be in the Lord’s presence and gaze upon His beauty is an experience that never has to end. The warmth and comfort of His love rivals any warm and fuzzy feeling from holidays, music and decorations. There are many things I could have requested for Christmas. But I have lived long enough to know that any item will eventually lose its shine and luster. But the beauty of the Lord is forever and He invites me to continually gaze on Him! Lord, keep me seeking You above all else. 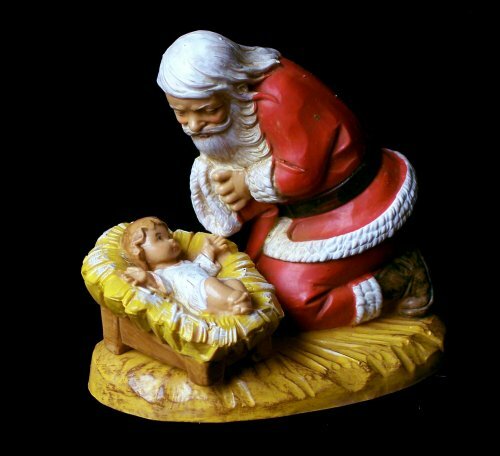 I have a figurine very much like this one and I love the perspective it puts on the real meaning of Christmas. However, I do enjoy the story and fun of Santa! It was precious to see the wonder and delight on the faces of my children when encountering Santa. And now I can enjoy it all again with my grandsons. But the real wonder and delight is in realizing who this baby Jesus is! Our verse for this very special day comes from the words spoken by an angel to Joseph in a dream. After realizing Mary was pregnant he was contemplating divorcing Mary quietly. The angel explained that the child was conceived by the Holy Spirit and he was not to be afraid to take Mary as his wife. Not only was he to name the baby Jesus, but people would refer to Him as Immanuel, meaning “God with us.” This would fulfill a prophesy spoken many years before by Isaiah. There are many sweet and good traditions surrounding Christmas. They can create warm feelings and special family times. But the real wonder and delight is that this baby is God with us! Merry Christmas! 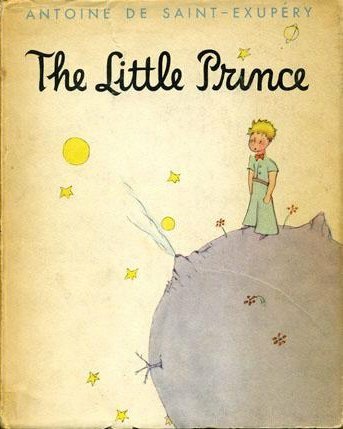 The Little Prince is a much loved story known to almost every French young person, including my three children. Written in 1943 it has been translated into more than 250 languages and has sold over 140 million copies worldwide. The simplicity of this story is appealing but the symbolism speaks to the reader on many different levels. The story consists of observations about life and human nature made by a Prince fallen to earth. Some have suggested that the Prince is a Christ figure as he is without sin and believes in a life after death. Our verse for today prophesies the birth of our Savior. One of the most beautiful names Jesus was given is, “Prince of Peace.” The angels heralded His birth saying, “on earth, peace to those on whom His favor rests.” (Luke 2:14) Jesus is our peace reconciling us with the Father. He is our peace with others as well, bringing together different races, creating in Himself one new humanity (Eph. 2:15). He does not stop there. Jesus is also the source of the peace within my heart. Because He has forgiven me my sins and brought me near to Himself, I can experience the “peace that transcends all understanding” (Phil. 4:7) regardless of troubling circumstances. Surely, He is worthy to be called “Prince of Peace” creating peace with God, peace with other believers, and peace within my heart. But there is more. One day His Kingdom will come to earth and we will finally enjoy true peace here on earth. Lord, keep my heart peaceful, trusting in You. I love watching my son-in-law learning to be a father to our newest grandson. Every day he picks up that sweet eight-pound bundle with more confidence. He is learning to distinguish the different cries right alongside of my daughter. It is so sweet to see all the cuddling and to watch the nurturing side of this macho man emerge. I wonder what their future relationship will be like. One thing is certain; once a Father, always a Father. My grandson cannot be “unborn” out of the family. The father-child relationship is forever. Our verse today prophesies the birth of Jesus, giving us several names for Him. Normally, when thinking of Jesus, the Son of God, we do not think of the title, “Everlasting Father.” However, Jesus being God Himself, shares all His attributes even though His role is different. Jesus is everlasting with no beginning and no end. He is also loving and nurturing like a Father to His children. I love the image of an attentive caring father. 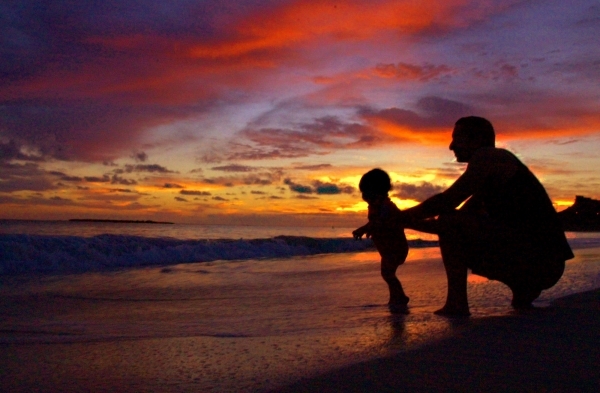 A loving father understands the vulnerability and weaknesses of his child. Jesus is the best kind of Father because He has lived the life He asks us to live. Because He Himself entered our world as a baby, He is in a position of a special understanding. And unlike earthly well-meaning fathers, the love of our Everlasting Father is a love that is unconditional and unending. Thank you Lord, for being my understanding, perfect, and loving Everlasting Father.